I understand your struggle so well when it comes to making sense of romantic love and your heart. I made it a personal passion to help you. You, with all of your life successes, have gone through the pain and confusion of sorting out how is it possible to be a standout in your career and fall apart in romance date after date?? I am able to ‘get’ what is really going on between the two of you, and what you are really feeling — even when you can’t put it into words. That is why my work moves quickly. I’ve discovered in my later years that I’m an intuitive empath. If you’re not familiar with that term, it means that I can sense your feelings and what caused them, even without you telling me. I have a natural skill to help you figure out what you are feeling and why and create a unique solution. This gift of mine for sensing, knowing and creative solutions saves you time. Additionally, from coaching both men and women, I’ve been able to use my intuitive empathy to ‘get’ relationship patterns and blocks in ways that I uniquely developed into my Law of Romance — the ultimate direction to get clarity in relationships — and explain phenomenon that happens in your everyday life. I know that with my passion for helping you, coupled with my natural capabilities, I go outside of the box and hone in on your real issue to turn it around very quickly. I think that’s what a relationship/dating coach should do for you! P.S. Read my story about how I got into coaching people and a my transformation of a very special and unique young woman who went from catatonic to top of her class. You know what is seldom talked about? That sometimes parenting is just plain difficult. How are we really supposed to know what to do in every situation? We want our children to turn out happy and amazing and we want to have done a good job parenting. As a teacher and coach to thousands of dance students, I understand and have the proven and easy “Hanson Parenting Method” to share with you. 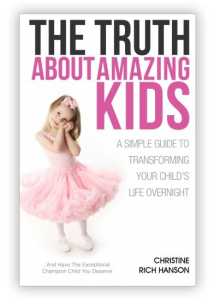 You will be stunned to find that the Hanson Method is a departure from conventional parenting and therefore the very reason that you will get results and your child will grow into being an amazing person on every level. Christine’s coaching is very hands on and situation specific. I have learnt key skills to navigate my bad- feeling relationship and I know that I will be better going forward with the current man in my life or with another. She was not only excellent during the sessions we had, but also in between, when I was going through tough situations in my current relationship. That truly made me feel taken care of while I also learnt how to react to the same situation effectively, while I was still in it. I feel better now, more grounded and courageous about going for what I want for myself from a relationship. Thank you, Christine! I am that frustrated, low self-esteem woman who had finally had it. About 2 years ago I met a man who I fell deeply in love with. Having been divorced for 2 years, I thought I was open and ready. To my surprise I failed with him the first time. I only knew my marriage, which had very poor communication. So I signed up for Rori Raye’s Commitment Blueprint. I learned so much and practiced. He came back, but only to disappear again. I found myself practicing with other men on dating sites, the whole lean back, get involved with yourself. I kept telling myself I was the jewel. I then hit a wall and was finding that this whole process was so overwhelming, because the more I practiced, the more men seem to just bring me in only to disappear. I then found Christine. We set up a time to talk. She gave me some beautiful insight to how I was practicing, but not yet capturing the true gift of the feminine energy. I had no idea that my job as a Corrective Exercise Specialist was masculine energy. Christine gave me the insight to how I need to practice this being-feminine skill as if I were a gymnast again on the balance beam–learning the essence of feminine energy and learning how to apply it to a situation I could relate to. She also gave me homework to practice that I had no idea was feminine energy. I have a different view of how this system all works. No more feeling like I have a ball on my nose and trying to keep it from falling. Thank you so very much, Christine. Christine is so incredibly warm, kind, funny and brilliant that words won’t do justice to describe her. She has this amazing way of making anyone feel soo calm that I have never experienced with anyone before. You could tell she truly cares about helping you. You could feel the love in her voice and perhaps that’s why I felt so at peace, knowing that I am not alone in this difficult situation. She is the ultimate feminine energy and can truly teach you how to get into your feminine energy within a very short time. She is absolutely worth every penny you would spend on hiring her. I feel so happy and blessed that I had the opportunity to have her as my coach. In my personal experience, Christine has an amazing way of being able to make someone feel totally calm when they are anxious or in distress. She helps you to look at your situation from a completely different point of view and will make you wonder how you didn’t see it that way before. She is full of expert advice and guidelines, which will help you get on the right track to exactly what you want, and fast. Her way of coaching is very gentle, but firm at the same time – Christine has a very relaxing effect and will help you get the results you desire in your dating/love life.